Medium: silkscreen (after the etching). Printed in Paris at the studio Arcay and published in 1953 by Editions d'Art d'Aujourd'hui, of Boulogne. Sheet size, including margins: 12 x 9 inches (305 x 230mm). A richly inked impression, as usual from this now rare series. Signed in the plate, not by hand. Condition: there is minor scuffing to the surface. Medium: original etching. Printed in 1946 by Quesneville on BFK Rives wove paper. Published in a limited edition of 300 for "Alternance" (an art and literary project featuring writers Paul Eluard, Pierre Mac Orlan, Ribemont-Dessaignes, et al., along with original prints by artists Jean Cocteau, Henri Matisse, Jean Laboureur, Edouard Goerg, Marie Laurencin, André Lhote, Valentine Hugo, Henri de Waroquier, Dignimont and Jacques Villon). These important cultural figures collaborated together just after the end of the Second World War. Plate size: 7 1/2 x 10 1/8 inches (190 x 255 mm). Signed in the plate (not by hand). A very rich impression! Medium: lithograph (after the painting). Published by Louis Carré in 1948 for "L'Art Glorieux" in an edition of 1800. Printed in Paris by Mourlot Frères. Image size: 8 1/2 x 6 inches (217 x 155 mm). Signed in the plate (not by hand). Condition: Although there is some minor age-toning to the paper, this is a richly inked impression and the color is exquisite. Medium: original etching. This Villon etching was published in Paris in 1956 by Manuel Bruker in an edition of 150-- this impression is from the deluxe edition of 15 on japon impérial laid paper, making it rather rare. Plate size 8 1/4 x 5 1/2 inches (210 x 138mm). A nice impression with full original margins. Not signed. Jacques Villon original etching "Les Vases"
Medium: original etching. This classic Villon etching was published in Paris in 1955 by Manuel Bruker in an edition of 200-- this impression is from the deluxe edition of 20, making it rather rare. Plate size 8 x 6 inches (205 x 155 mm). A nice impression on Rives wove paper with deckle edges and full original margins. Signed in the plate, not by hand. Condition: there is minor creasing to the top left corner of the sheet (in the margin and not affecting the image). Medium: original etching. Catalogue reference: Ginestet-Pouillon 525. This Villon was issued for XXe Siecle (No. 2) in 1952, published in Paris by San Lazzaro. Plate size: 9 1/2 x 7 5/8 inches; 245 x 193mm. A beautiful, rich impression on wove paper. Signed in the plate (not by hand). Condition: there is foxing to the paper. Medium: lithograph (after the painting). Printed in Paris in 1964 by Fernand Mourlot and issued in an edition of 2000. The total sheet size is 10 x 7 1/2 inches (255 x 188 mm). This Jacques Villon lithograph is from the scarce and lavishly-produced limited edition catalogue, "Prints from the Mourlot Press". Published in 1964 by Mourlot on the occasion of their landmark traveling exhibition, which was sponsored by the French Embassy and The Smithsonian. Signed in the stone; not hand-signed. Jacques Villon original etching "Homme Prechant"
Medium: original etching. 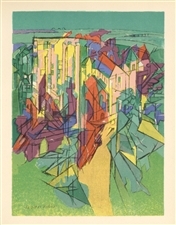 This classic Villon etching was published in Paris in 1955 by Manuel Bruker in an edition of 200. Plate size 11 x 8 1/2 inches (275 x 218 mm). A nice impression on Arches wove paper with deckle edges and full original margins. Not signed. Jacques Villon original etching "Portrait"
Medium: original etching. This classic Villon etching was published in Paris in 1955 by Manuel Bruker in an edition of 200-- this impression is from the deluxe edition of 20, making it rather rare. Plate size 8 1/2 x 7 inches (220 x 180 mm). A nice impression on Rives wove paper with deckle edges and full original margins. Unsigned. Condition: there is some creasing near the top left. Jacques Villon lithograph "Le Grain ne meurt"
Medium: lithograph (after the painting). Published by Louis Carré in 1948 for "L'Art Glorieux" in an edition of 1800. Printed in Paris by Mourlot Frères. Image size: 7 x 15 1/2 inches (177 x 395 mm); with center fold and stitch holes in the margin, as issued. Signed in the plate (not by hand). Condition: There is a tear in the margin at the bottom of the sheet. Although there is some minor age-toning to the paper, this is a richly inked impression and the color is exquisite. Medium: original lithograph. This Jacques Villon lithograph was printed in Paris by Mourlot and published in 1959 for the deluxe art revue XXe Siecle (issue No. 12 "Psycologie de la technique"). Sheet size: 12 3/8 x 9 1/2 inches (315 x 243 mm). Signed in the stone (not by hand). Condition: there is a small bump to the top left corner of the sheet. Jacques Villon lithograph "Les Oliviers entre Cannes et Mougins"
Medium: lithograph (after the painting). Published by Louis Carré in 1948 for "L'Art Glorieux" in an edition of 1800. Printed in Paris by Mourlot Frères. Image size: 8 1/2 x 11 3/4 inches (210 x 292 mm); with center fold and stitch holes in the margin, as issued. Signed in the plate (not by hand). Jacques Villon lithograph "Le Trois Ordres"
Medium: lithograph (after the painting). Published by Louis Carré in 1948 for "L'Art Glorieux" in an edition of 1800. Printed in Paris by Mourlot Frères. Image size: 8 1/2 x 6 3/8 inches (216 x 160 mm). Signed in the plate (not by hand). Although there is some minor age-toning to the paper, this is a richly inked impression and the color is exquisite. Jacques Villon lithograph "Le Grands Fonds"
Medium: lithograph (after the painting). Published by Louis Carré in 1948 for "L'Art Glorieux" in an edition of 1800. Printed in Paris by Mourlot Frères. Image size: 5 1/2 x 7 3/4 inches (140 x 198 mm). Signed in the plate (not by hand). Jacques Villon lithograph "Acrobate au saut perilleux"
Medium: lithograph (after the painting). Published by Louis Carré in 1948 for "L'Art Glorieux" in an edition of 1800. Printed in Paris by Mourlot Frères. Image size: 6 x 7 3/4 inches (155 x 195 mm). Signed in the plate (not by hand). Medium: original etching. 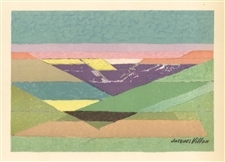 This Jacques Villon etching was issued ca. 1965 by The Collectors Guild. Printed on wove paper, the plate size is 9 x 3 1/2 inches (225 x 90 mm); sheet size 11 1/2 x 6 1/2 inches (the margins have been trimmed). Not signed. Condition: there is some skinning to the paper just to the right of the platemark. 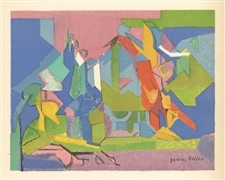 Jacques Villon lithograph "Homage to Dufy"
Medium: lithograph (after the watercolor). Jacques Villon was one of the artists who contributed compositions to Marcelle Oury's "Lettre a mon peintre" in homage to Raoul Dufy. Printed on Arjomari wove paper by Mourlot Freres and published in 1965. Sheet size: 11 3/4 x 9 3/8 inches (300 x 238mm). Signed in the plate (not by hand).